The document is jammed in the ADF. NOTE - The power cannot be turned off while the machine is sending or receiving a fax, or when the received fax or the unsent faxes are stored in the machine's memory. 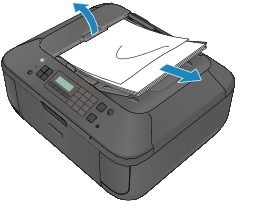 Make sure the machine completed sending or receiving all faxes before disconnecting the power cord. If you unplug the power cord, all the faxes stored in the machine's memory are deleted. 1. If you press the [Stop] button during scanning the document will stay where it is in the ADF and a message will appear on the LCD. 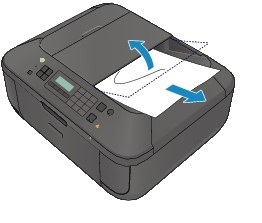 Press the [OK] button and the machine will feed the document out of the ADF. 2. If the original gets jammed in the ADF press the [Stop] button to cancel printing. 3. Turn off the machine. 5. Pull out the jammed document from the ADF. 1. 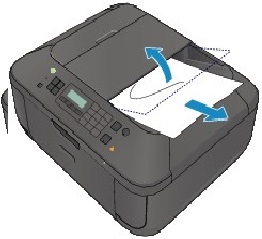 Close the document feeder cover and then turn on the machine. 2. If the document is jammed in the document output slot, close the document tray as shown in the figure below and pull out the document. 1. Note - The document may not feed properly depending on the media type, or your environment, such as when the temperature and humidity are either too high or too low. In this case, reduce the number of document pages to approximately half of the loading capacity. If the document still jams, use the platen glass instead. When rescanning the document after clearing the error, rescan it from the first page. No document in the ADF. 1. Press the [OK] button to resolve the error and then try again after loading the documents.